As I was making my salad the other day (my standard gluten-free lunch), I realized something about myself: I put black pepper on just about everything that's not sweet. From salads to sandwiches to soups and potatoes... I love it. Definitely my favorite spice by far. My favorite spice is pepper too! I put tons of it on lot's of different foods. 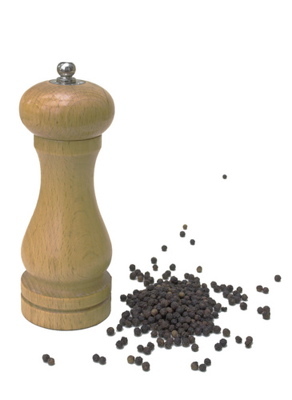 If I am eating out and get fresh cracked pepper the waiters almost laugh at me because they have to keep cracking it and cracking it. I just love it. Posh is my favorite Spice. I use to use cajun pepper and now the company doesn't make it anymore so I'm on the lookout for salt-free cajun seasoning. I don't know of any salt-free cajun seasoning, Dru...but I put Tony Chachere's cajun seasoning on just about everything except sweet stuff. BJ, cracked pepper is SO good, though it always gets stuck in my teeth. Dru and Shel, I've only marinated using Cajun seasoning--I must try sprinkling it like pepper. Yum, yum. Katie, that sounds wonderful. I love all those. Aryn, hmmm, you may be on to something! Linda, that one's my husband's favorite, too.